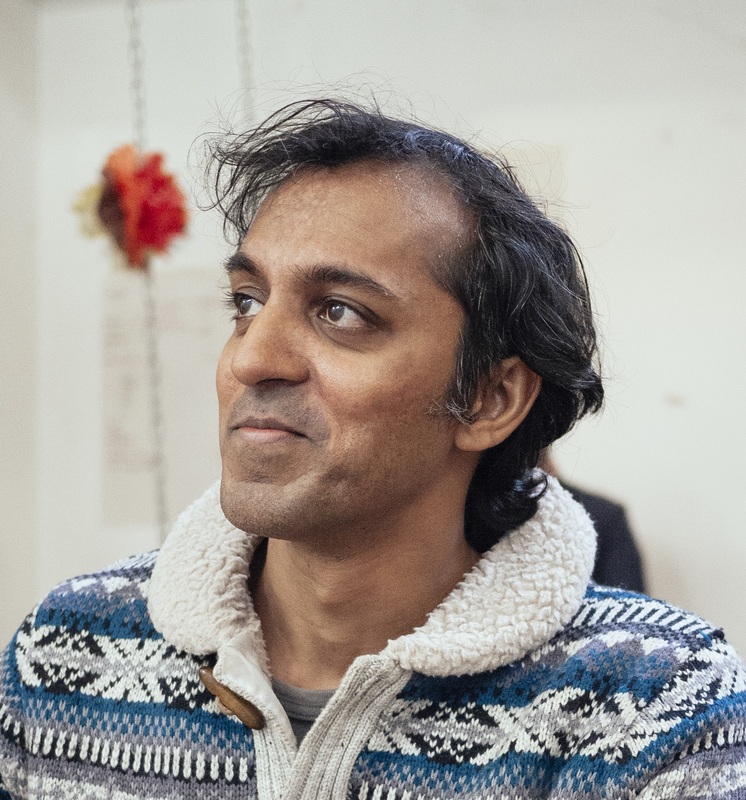 In Rajeev Balasubramanyam's (In Beautiful Disguises) smart, engaging comedy of errors crossed with a charming late-stage coming-of age story, British-Indian Professor P.R. Chandrasekhar is at the top of his professional game. He is the most respected trade economist in the world as well as an esteemed Emeritus Professor of Economics at the University of Cambridge. An academic snob, the professor is unforgiving of those who don't quite measure up to his intellectual standards. He has a big, soft heart and adores his children, but his ego and insufferable need to be right rather than happy alienates those he loves. The reverence shown to Chandra in his professional world is sorely lacking in his family life--what remains of it, anyway. His long-suffering wife, Jean, left him for an American psychiatrist named Steve, and his three grown offspring keep their distance. Sunny, a narcissist like his father, lives in Hong Kong successfully pursuing a career as a "financial karma" motivational speaker. Disdainful Radha, once the apple of her father's eye, can no longer tolerate her father's smug self-importance and has completely cut off contact with him. And Jasmine, the youngest, who lives with her mother and Steve in Boulder, Colo., has morphed from a sweet, loving child into an angst-ridden, angry high school senior. Even worse, she refuses to cooperate with her education-focused father, a situation Chandra cannot begin to understand. Professor Chandra Follows His Bliss opens with a calamitous but also hilarious scene: the 69-year-old professor is on the cusp of winning the Nobel Prize in Economics, as predicted by the same pundits who were sure of a Hillary Clinton win in 2016. Alas, the prize goes to someone else, Chandra's dry, sardonic response to the loss is both endearing and a stellar introduction to a curmudgeon the likes of which you've never seen before. 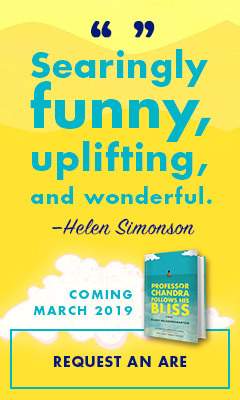 The Nobel Prize disappointment is followed by a health setback, and the workaholic professor is admonished by his doctor to work less and have more fun. A sabbatical is in order. He ventures to California to teach part time at UC Bella Vista, a college town culturally and aesthetically as far removed from Cambridge as could possibly be. Leaving the stuffiness of his exalted university, well suited to his rather stuffy personality, is a bit of a challenge for Chandra, but he likes the weather and the short travel distance to his daughter in Boulder. Visiting Jasmine also means facing happily remarried Jean in her new life with Steve. Laid back, über-confident Steve is the perfect foil for the jilted and uptight professor. Pompous or not, Chandra is genuine and touching in his desire to connect with Jean and their daughter. Having bombed the SATs, Jasmine starts acting out in bewildering ways. Meanwhile, Steve corners Chandra into spending three days at the famous Big Sur spiritual retreat, the Esalen Institute. And therein begins the professor's California adventure in earnest. Reluctantly, he attends a spiritual workshop at Esalen that becomes the catalyst for a life-changing inner transformation. The workshop is exactly what Chandra needs--it teaches him tolerance, self-awareness and acceptance of others. He learns to silence the critical voice inside his head. He also begins to enjoy himself, finally understanding his American doctor's advice to "follow his bliss." The professor befriends a fellow Esalen guest, Dolores, who runs the Cove Zen Center, a Colorado monastery, with her husband. Chandra's path to self-enlightenment is strewn with obstacles, including his ego, Jasmine's academic derailment and years of negative conditioning by his own unforgiving father. Balasubramanyam gently teases the self-important Chandra but also endows him with the emotional and spiritual tools needed to repair damaged family bonds. Accompanying Chandra as he sets about untangling the knots in his personal life is both uplifting and entertaining. The language of spiritual healing comes naturally to Balasubramanyam, and he deploys it to great effect in this superbly relevant story for our times. Back in Boulder, Jasmine turns into every parent's worst nightmare and needs serious intervention. Thanks to his friendship with Dolores, the professor arranges for his daughter to stay at the Cove Zen Center. As Christmas approaches, Chandra invites Jean, Steve and Sunny to join him at the monastery, intent as he is on securing the family's support for Jasmine during the holiday season. As Professor Chandra Follows His Bliss draws to a rewarding conclusion, the now spiritually refined professor finds himself happily surrounded by those he once drove away. Born in Lancashire, England, Rajeev Balasubramanyam studied at Oxford, Cambridge and Lancaster universities. He is the author of the prize-winning novel In Beautiful Disguises. He was a fellow of the Hemera Foundation, for writers with a meditation practice, and has been writer-in-residence at Crestone Zen Mountain Center and the Zen Center of New York City. His journalism and short fiction have appeared in the Washington Post, the Economist, the New Statesman, the London Review of Books, Paris Review, McSweeney's and many others. He lives and works in Berlin. 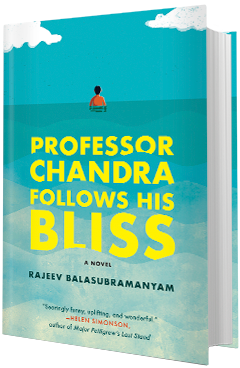 Professor Chandra Follows His Bliss will be published by Dial Press on March 26, 2019. 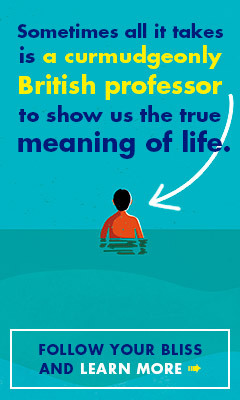 Is the character Professor Chandra the embodiment of someone you know? How did he come about and what makes him tick? My father is a development economist, and I spent my childhood around Indian economists, but Professor Chandra isn't based on any one person. There's plenty of me in him, but he isn't me, either. All I know is that from the first sentence I wrote--which is now somewhere on page 15 of the novel--I knew him: he was fully formed. I knew his prejudices and peccadilloes, and, most important of all, I knew his idiolect. His essence is the combination of a tremendous ego with a good heart, and his genuine desire to change and learn, no matter what it takes. Where did you get the inspiration for Professor Chandra's spiritual journey? I have a committed meditation practice and have spent time in all the places that Chandra visits: Esalen and Crestone Zen Mountain Center (Cove, in the novel). I wondered what would happen if someone embarked on such a journey without any experience. Professor Chandra is definitely this; he's bewildered by so much that he encounters, but he persists because he has to, because he needs to. The idea of juxtaposing a neoliberal Indian economist from my father's generation with Californian spiritual hippies filled me with glee. Professor Chandra is an unlikely spiritual seeker, perhaps, but I think spiritual motivation is common to all of us: we all want to put an end to our suffering, and we all need to love. Chandra is no exception. How does meditation help your writing practice? Meditation makes me a more conscious person, which is surely good for my writing. It allows me to examine the things that I might otherwise suppress out of fear or shame or guilt. It enables me to work through anger and fear, to understand myself, and hence other people, more fully. This helps to open up new subjects to write about and provides a way of exploring them. It gives me something to share with my readers. Has growing up as a South Asian in 1980s England influenced your writing? I grew up in a very white, racist area of Lancashire. There was no protection from the racists; it was almost like living in a war zone and, by the time I left aged 18, I was severely traumatized. It's hard to say how this has influenced my writing, but I think these experiences made me into a writer. For me, writing is an act of self-witnessing. It's a way of being myself completely. When I was a child, there was no other way of doing this. There were no sympathetic witnesses to what I was going through and there was no way of being myself, so I had to have writing. I needed it. It was a way of telling myself that I was a person, that I existed, that I mattered, too, that my version of events couldn't simply be erased or dismissed. I suspect that without writing I would live in a very disassociated way, suppressing my own emotions, living inauthentically, in denial. I'm so glad this didn't happen. I think writing saved me first, and then meditation, which is another means of self-witnessing. What do you most want readers to take away from Professor Chandra's struggles? By being honest, and by refusing to allow his ego to control him, Professor Chandra manages to gain some self-awareness and self-healing. He's such a stubborn person, so when he decides to be more humble, his stubbornness actually helps him. What I'd like readers to take away is hope, or perhaps, and even more importantly, a sense that faith (in the general sense) isn't worthless or ridiculous. That if we hang in there, if we're honest, something good will happen eventually, and this will always be more rewarding than materialism or cynicism or denial. What does life in Berlin offer you as a writer? It's a place where I don't feel weird. It's one of the very few capital cities that isn't controlled by the rich: hippies and punks and artists and musicians and bohemians and anarchists are the norm in Berlin. I love this. And people read there. And generally, people aren't so enthralled by consumerism, advertising, competitiveness, the "time is money" mentality and stress, stress, stress and money, money, money--all the things that have made life in many other cities so unhappy. I don't know how long Berlin will stay this way, but to live like this even for a few years feels like such a luxury, such a relief. I'm in the planning stages of a new novel, and I'm working on a nonfiction essay about meditation and anger. Everyone seems so angry all the time these days, a feeling definitely magnified by social media, and I wanted to write about how meditation has helped me understand anger. It has allowed me to accept and observe my own anger, and in this way to let it go, on a daily basis and in bulk over time. So many of us feel there's no option but to suppress or to express anger, but meditation gives us a third: observation. It's made me feel much lighter, happier, less crazy and obsessive. I want to share this experience. Do you have any advice for aspiring writers out there?